Home » Student Life » A Guide to Dressing Business Casual + Owning it! There are numerous occasions throughout the semester that we are required to dress business casual. 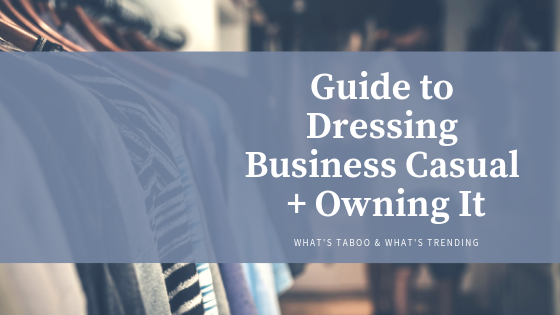 Whether it’s for an interview, career fair, internship/work, or an event – Whatever the case may be we all find ourselves questioning the dress code. Remember that business casual is a combination of casual and business dress. With that said, there is a fine line between casual and “business” casual. And that line just seems to keep getting finer…I hit the mall to figure out what is on trend and this is what I found on a mannequin at Nordstrom. 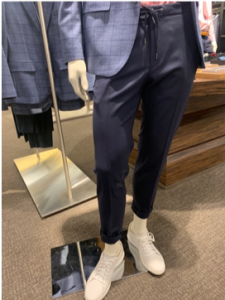 Can we just take a moment and digest these pants, that were designed for business casual wear – they have drawstrings. DRAWSTRINGS. Just like your comfiest sweatpants. I’m all about comfort, the comfier I am the happier I am. But am I too harsh to say a line was crossed here?? As much as we would like to dismiss what we wear because we are so confident in our personality and skillset, attire is important! When you present yourself well, you will be perceived well! Trust me, this was a difficult concept for me to accept at first too because I am definitely that typical college student that loves to sport leggings and a sweatshirt on the daily. As cliché as it sounds, when you feel good about your outfit and appearance, you will be more confident! I know we’re all familiar with the dress code, but it can’t hurt to recap the basics. The business casual dress code can vary depending on the event or place but there are some pieces you should always stay away from. Jeans – not even your black jeans that could pass for slacks. Tennis Shoes – just don’t do it. Especially not your slip-on. There are some cases you may be able to get away with a sleek sneaker but always take what you are dressing for into consideration. Open-toed shoes – no matter how cute the color of your nail polish is. If you are new to dressing business casual, I would suggest starting your wardrobe with the basics. It will be easy to accumulate basic pieces that you can mix and match to create multiple outfits. You may even have a lot of these in your closet already! ▪ Dresses and Skirts – keep dresses and skirts professional by considering the length and shape. Always lean to the conservative side. ▪ Shirts – collared, always tucked in, polos are okay during warmer months – tucked in!! 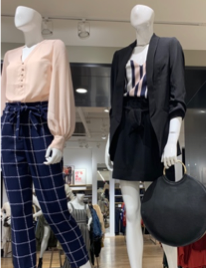 ▪ Blazer + Skirt Combo – a solid color skirt paired with a plaid blazer is all over stores right now! 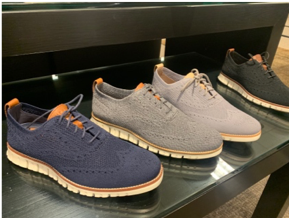 ▪Sneaker-Like Oxfords – I noticed there are so many oxfords on the market right now that are lightweight and seem like they would fit similar to a sneaker! I mentioned earlier that the dress code varies depending on what you are dressing for. So please consider this! If you are dressing for an internship be sure to ask for specific dress code guidelines most companies have them, and some companies might even allow jeans or sneakers! Although if you are dressing for an interview or career fair, I would always play it safe and stay away from jeans and sneakers. In those cases, it is better to lean to the more business side. Dressing business casual can be fun!! Look for ways to show off your style by shopping for pieces that have character. Men can make a statement with a trendy pair of dress shoes or women with a pair of statement earrings. Stay true to your style and who you are! Don’t wear something just because you think it is what you are “supposed” to wear. Look for pieces that you actually like, if you aren’t comfortable wearing a dress, don’t do it. The ultimate goal is to dress so that you feel your best! Now that you can navigate the business casual dress code and know what’s on trend, go put together your best biz casual outfit and find an UMSL Business event to attend! You got this, own it! !